Creation: Looks to have been assigned by 1944 as a new primary number to a corridor was placed into the state highway system apparently without number in the Aug 1932 CTB. It initially ran from US 17-VA 337 (now Elm St) northeast along George Washington Hwy to Greene St, then north to Portsmouth Blvd, then east to 4th St then Wythe St to Court St to High St west to end at US 58 (now just High St/Washington St jct). This is the 4th VA 141. The first indication this occurred is it is shown unlabeled on the 1944 Official and it did not get explicitly labeled until the 1975 Official. It is not shown at all in the 1945 Norfolk County Map but is explicitly present by the 1951 Norfolk County issue. Adjustments: In March 1968 (CTB), VA 141 was extended southwest to its current endpoint, replacing what was then US 17 Bus. Additionally, it was rerouted to leave George Washington Hwy via Effingham, then west on London Blvd to end at US 58/VA 337 ALT as it does today. Multilaning of VA 141 is shown on its entire run starting with the 1971 Official. Posted: Fully posted; The last cutout was removed in 1993 in front of Norfolk Naval Shipyard on a side street near Portsmouth Blvd. Comment: VA 141 serves Norfolk Naval Shipyard and Downtown Portsmouth. VA 141 #1: Appeared in 1923 as a renumbering of VA 14 CONN, running from VA 33 (now US 11) Natural Bridge east to VA 14 (now SR 684) Glasgow. In April 1924 (CTB), VA 141 east was truncated to today's SR 608 (was VA 14) west of Natural Bridge Station. The route east to Glasgow became part of VA 14. Today it is SR 773 and VA 130. In late 1926, US 60 was added to VA 141. In Aug 1928, VA 141 was renumbered as VA 801. Today this is part of VA 130. VA 141 #2: Appeared June 1932 as new primary routing. Did not appear explicitly on maps or in the CTB minutes but with the pattern of numbering routes in District 1 I believe this was an upgrade to CR 6 and ran from VA 11 (now US 23 Bus) Norton south to nearly the Scott County Line at High Knob. In July 1933, this became VA 73. Today it is SR 619 except north of today's US 23-58 ALT freeway it used 12th St.
VA 141 #3: Appeared July 1933 as a renumbering of VA 426. It ran from US 1 Dinwiddie CH east to the Prince George County line at Carson. In Aug 1933 (CTB), VA 141 was extended east to US 301. In May 1943 (CTB), VA 141 was downgraded to SR 703 and SR 604. VA 141Y: Appeared Aug 1933 (CTB) as new primary routing, running from VA 141 Carson northeast to US 301. Some of this had been part of original VA 24. In May 1943 (CTB), VA 141Y was downgraded to SR 604 and SR 623. VA 141Y was shown but not labeled on official maps. Creation: Appeared in July 1933 as a renumbering of VA 439. Ran essentially as it does now. This is the 3rd VA 142. Adjustments: In the late 1960s or so, the west end of VA 142 was reconfigured to accomodate an expanded interchange of I-85 and US 1. This actually eliminated a small far flung piece of VA 319. Comment: VA 142 is blown off by I-85 although the Squirrel Level Rd exit is right next to VA 142. Here is a state route that makes no sense. Why not extend the designation into downtown Petersburg? The 1939 VDOT report on primary system development had recommended that VA 142 be decommissioned in its entirety. VA 142 #1: Appeared in 1923 as new primary routing, running from VA 14 (now US 60 Bus-220 Bus) Covington south to Eagle Rock via Glen Wilton. In March 1924 (CTB), VA 142 was extended south 9 miles towards Fincastle. Also in March 1924 (CTB), VA 142 was moved to run from Covington to Eagle Rock via Iron Gate. The 1923 Official shows this to be west of the James River until Eagle Rock. Most of this is not a road today, save for SR 633 and SR 835. If the map is slightly shifted it may have used SR 835 and SR 622 down to Gala. In Feb 1925 (CTB), VA 142 was extended south 9.5 miles through Fincastle. 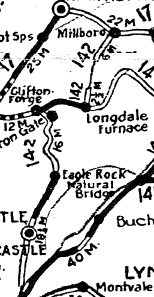 Also in Feb 1925, VA 142 was extended east along VA 14 to about Longdale, then north 2.63 miles as new routing. Also in Feb 1925, a second piece of VA 142 appeared, running from VA 17 (now VA 39) Millboro Springs south 5.76 miles. 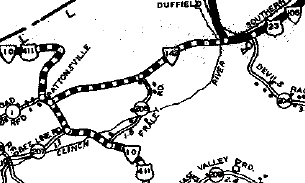 In May 1926 (CTB), the original piece of VA 142 was extended south to VA 33 (now US 11) Troutville. Also in May 1926, the second piece was extended south 3 more miles. In October 1926, both pieces of VA 142 (there was still a gap of 7.5 miles around the Bath/Alleghany Line) was renumbered as part of VA 17. Today this is SR 670 from Troutville to Trinity; US 220 from Trinity to past Fincastle; all of SR 655 north to Owens; US 220 to SR 876 to Eagle Rock; VA 43 and US 220 towards Clifton Forge except north of Gala it probably used SR 722 and in Iron Gate the route used Market St/5th St/Commerce Ave; US 220 Business into Clifton Forge except it went further west on Verge St and crossed the river to connect to River St up to Main St; US 60 Bus east then veered north on Ingalls Dr then east on SR 662 Chesnut over toward the east end of US 60 Bus, then picked up SR 632 Longdale Furnace Rd: VA 42 north to VA 39. VA 142 #2: Appeared in June 1932 as new primary routing. Ran from US 411/VA 10 (current SR 638) near Pattonsville and US 23/VA 106 (now SR 864 jct with SR 871) Duffield. In July 1933, VA 142 was renumbered as US 58. Today the western half is SR 604. Creation: Appeared in June 1944 (CTB) as a renumbering of VA 168. This is the 3rd VA 143. Originally it ran from US 60/VA 168 (Jefferson Ave) Newport News east on 34th/35th St one-way pair, then Shell Rd into Hampton. VA 143 then used Back River Rd to Quenn St east to end at US 60 Armistead Ave. Adjustments: In March 1950 (CTB), VA 143 was removed from the Shell Rd to Queen St alignment outside Newport News and placed on 28th St/Victoria Blvd to end at US 60 Kecoughtan Rd. This was an upgrade to SR 1540. The old alignment became secondary except a bit of Shell Rd plus Back River Rd remained part of VA 167 (now decommissioned). However, the route within Newport News was unchanged, leaving a discontinuous/off-set routing. In Aug 1952 (CTB), VA 143 was removed from the 34th/35th St pair to instead use 28th St which lines VA 143 up with the Victoria Blvd reroute in 1950. Official maps continued to show the discontinuous route through 1956. East along US 60 to what is now I-64, then replacing US 60 through Phoebus to end at US 258 Ft. Mornoe. The '58 VDOT County Atlas shows VA 143 duplexed with US 258 to Old Point Comfort but I am not certain that actually happened. In central Hampton, US 60/VA 143 was split into one-way routings in central Hampton. EB used Queen St. WB left Queen using Eaton north to Lincoln west to Armistead south to Queen. Northwest along Jefferson Ave replacing more VA 168 to what is now I-64 exit 255. From Mercury Blvd to I-64 this was co-signed as TEMP VA 168 until 1960 or 1961. In Aug 1960 (CTB), VA 143 was placed on one-way alignments in Newport News - WB using 28th St and EB using 27th St. In Oct 1965 (CTB), VA 143 was extended over more VA 168 all the way to Camp Peary as it runs today. In Jan 1979 (CTB), VA 143 EB was removed from Queen St and placed on Settlers Landing Rd instead. The Armistead Ave piece became an extended VA 134 while Queen St became a mall. I cannot find any other CTB references so this may also have been when the one-way split in central Hampton went away. In March 1979 (CTB), VA 143 was rerouted in Phoebus. Initially it ran on Mallory St between Mellen and County. Now it left County on Libby to Mellen. The Mallory St piece became an extended VA 169. 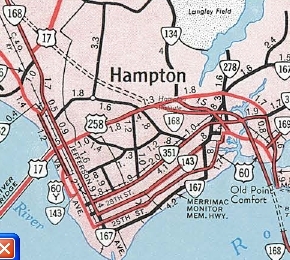 VA 143 is first shown as multilaned on the 1955 Official, in Hampton from the Newport News Line east to VA 167. VA 143 was multilaned on 28th St in Newport News and also when added to Jefferson Ave in 1957. VA 143 was multilaned when it replaced VA 168 all the way to VA 162. VA 143 was multilaned on its US 60 duplex in 1979. Truck Route: Appeared in mid-2000s in Phoebus. Starts at I-64/US 60 junction and uses Woodland Drive to Mercury Blvd to Fort Monroe. The purpose is to avoid two right angle turns in Phoebus. Technically the easternmost 0.28 miles are maintained by Fort Monroe. VA 143 #1: Appeared in June 1923 as new primary routing, running from VA 14 (curr VA 159-311 jct) Crows south to the WV line at Sweet Chalybeate Springs. The north end was north of VA 159's crossing of Tygers Creek. In Aug 1928, VA 143 was renumbered as an extended VA 22. Today it is part of VA 311. In Sept 1942 (CTB), VA 143 was downgraded to SR 625 and SR 607 (now SR 646). Today the route is cut off by the US 460 freeway. Creation: Appeared in July 1933 as a renumbering of VA 425. It originally ran from VA 37 (now VA 10) Chester to VA 145. This is the 2nd VA 144. 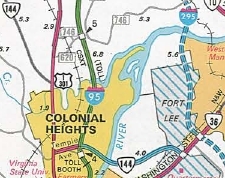 Adjustments: In May 1943 (CTB), VA 144 was extended west with VA 10 a short distance, then replaced SR 621 south to US 1-301 near Colonial Heights. 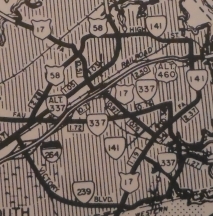 In Aug 1987 (CTB), VA 144 was extended south with US 1-301 to Temple Ave, then east as new primary routing to VA 36. VA 144 was first multilaned, on its VA 10 duplex in 1976. VA 144 was multilaned on its entire 1987 extension to Fort Lee. Posting: Fully posted; An error US 144 shield has existed at US 1-301 for several years. Other names: Temple Ave (e of US 1-301); Boulevard/Jefferson Davis Hwy (US 1-301 duplex); Harrogate Rd; Hundred Rd (VA 10 duplex); Chester Rd. Comment: The world's largest Arbys is supposedly on VA 144 east of I-95. East of the Appomattox River is limited access. The 1939 VDOT report on primary system development had recommended that VA 144 be decommissioned in its entirety (then existed only north of VA 10). VA 144 #1: Appeared in April 1924 (CTB) as a renumbering of VA 14. It began at VA 14 (now VA 293) Danville and used S. Main St, then VA 86, then College Park Dr/Old Yanceyville Rd, more VA 86, then Walter Mill Rd to the North Carolina State Line. In Aug 1928, VA 144 was renumbered as VA 301. Creation: Appeared in July 1933 as a renumbering of VA 410 as the only VA 145. Initially, it ran from VA 37 (now VA 10) east to today's SR 1625 (old US 1). See scan in VA 144 entry. 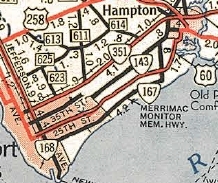 Adjustments: About 1935, VA 145 was extended east over what had been US 1 to its current ending. Posted: Fully posted; VA 145 is posted from both directions on VA 10 as continuing west but this is into a strip mall. Comment: VA 145 provides access to Chesterfield CH from US 1 but is not memorable in any way. The 1939 VDOT report on primary system development had recommended that VA 145 be decommissioned in its entirety. Creation: VA 146 was created Jan 1976 (CTB) as new freeway running as it does now. This is the 2nd VA 146. Comment: VA 146 serves to allow Downtown Expwy traffic to reach Powhite Pkwy (and vice versa). There are partial interchanges at each end, plus one partial interchange with Maplewood Ave in between. VA 146 was not posted at all until July 2003 (first reported by Zachary Robbins). VA 146 is not shown on any official state maps. VA 146 #1: Appeared in July 1933 as a renumbering of VA 430. It began at VA 5 at the New Osborne/Old Osborne jct at VA 5, then used Old Osborne Tpk to an abandoned alignment northeast to Bickerstaff Rd west back to current VA 5, then north ot Orleans St. VA 146 then cut east on Orleans St to end at Fulton St which VA 5 originally was using. In March 1943 (CTB), it appears VA 146 was removed from the Bickerstaff Routing to use current VA 5 through this area. In March 1949 (CTB), VA 146 was radically altered (essentially swapping places with VA 5), although one portion was not changed. VA 146 began at the same point but instead used New Osborne Tpk, Newton St and Hatcher St to Williamsburg Rd, then Fulton Rd north to Orleans St west to Main St which is where VA 146 ended at the rerouted VA 5. In Jan 1962 (CTB), VA 146 was decommissioned, though it didn't disappear from state maps until 1966. Creation: Appeared in July 1933 as a renumbering of VA 418 as the only VA 147. Initially, it ran essentially the way it does now. Adjustments: In Apr 1934 (CTB), VA 147 was extended east on Cary St to end at US 360 14th St. 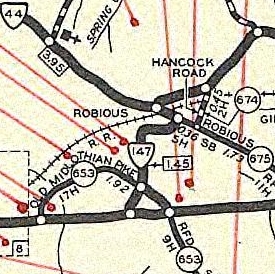 In Nov 1952 (CTB), VA 147 was straightened out in the Robious Rd area to be put on its present routing. Before, it used to begin at US 60 as now, then cut east through what is now non-continuous routing through two apartment complexes, then north on Dunbrook Rd to SR 675, then west back to present VA 147. VA 147 was also removed from Big Oak Ln. See scan under VA 147Y entry. In Aug 1959 (CTB), VA 147 was placed on one-way splits in central Richmond. EB used the original route (Cary St) while WB used Main St/Ellwood Ave/Thompson St. 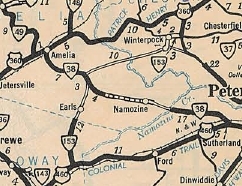 In Dec 1960 (CTB), VA 147 east was truncated to US 1-301. In Apr 1983 (CTB), VA 147 east was extended to US 60 at 9th St. 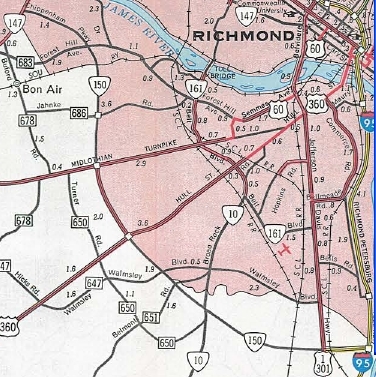 In 1959, VA 147 was multilaned in downtown Richmond by virtue of being placed on one-way splits. In 1972, VA 147 was multilaned from the James River west to about Cranbeck Rd. In 1988, VA 147 was multilaned from Cranbeck Rd west to US 60. Posted: Fully posted; a cutout or two still available in downtown Richmond. Comment: VA 147 provides an alternative to US 60 for reaching Richmond. Va 147 passes through some nice areas in western Richmond. VA 147Y: Appeared in July 1933 as a renumbering of VA 418Y. It was the SE piece of a triangle at the US 60 jct near Midlothian. It met US 60 at SR 653 which was using today's Branchway Rd and met VA 147 at today's Old Buckingham Rd. It appears VA 147Y was decommissioned in Nov 1952. Today the road is physically destroyed and is now a parking lot. Creation: Appeared Jan 1980 (CTB) as an upgrade to SR 775. Carroll County had request that VA 97 be extended east down SR 775 to US 52 Fancy Gap. The CTB gave them VA 148. This is the 2nd VA 148. Posted: Fully posted although always without direction banners. Error US 148 shield exists at I-77 NB ramp. Comment: VA 148 connects US 52 to I-77 above the section of US 52 that is not recommended for trucks. This is also a good way to access the Blue Ridge Pkwy from I-77. VA 148 #1: Appeared in July 1933 as a renumbering of VA 412. It ran from US 360 (now just Mt Olive Ln) near Chula northeast to the Appomattox River. In May 1943 (CTB), VA 148 was extended east along US 360, then south replacing SR 607 to end at VA 38 Scotts Fork. In April 1944 (CTB), VA 148 was truncated to run only from VA 38 to US 360. 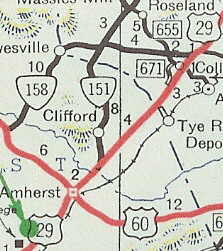 The route north of US 360 became SR 604 which it remains except VA 148 used SRs 636/740 through Chula. In Aug 1951 (CTB), VA 148 was renumbered as part of VA 153. Creation: Appeared in 1943 or 1944 as a renumbering of the southern piece of VA 164. It initially ran from VA 165 east to 0.4 miles short of SR 615 (SR 629 is shown clearly between VA 149 and SR 615). This is the 2nd VA 149. Posted: Fully posted at VA 165; there is one VA 149 shield in each direction on General Booth Blvd (one erroneously stating it heads north). Circle 149 shields existed in the early 90s but are gone today. Comment: VA 149 has the same distance as it did in 1958. Therefore its endpoint has not been moved to the General Booth Blvd/Princess Anne Rd intersection. Instead, it ends at the point Princess Anne Rd begins its multilaning before this junction (old SR 629 is visible to the right). Here is a designation that would make some sense if it either went to Sandbridge or the Virginia Beach Resort area. Otherwise, why bother...? VA 149 #1: Appeared in July 1933 as a renumbering of VA 422. It ran from VA 49 (now SR 681) Morven east to SR 616-636 Lodore. See scan under VA 148 #1. In Sept 1942 (CTB), VA 149 was downgraded to SR 635 (now SR 616). Creation: Appeared in May 1967 (CTB) as an upgrade to SR 892 to be effective July 1, 1968. It initially ran from US 1-301 to VA 147. This is the 3rd VA 150. 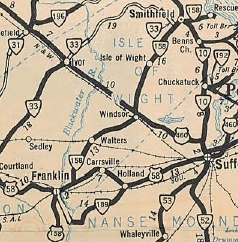 Adjustments: Around 1969, VA 150 was extended east to I-95. In Oct 1989 (CTB), VA 150 was extended northwest as new freeway across the James River to its current end at Parham/River Rds. Improvements: VA 150 was paved upon inception and was 2-lanes everywhere. VA 150 was freewayed from US 1 to I-95 in 1969. VA 150 was freewayed from US 60 to US 360 in 1971. VA 150 was freewayed from US 60 to Forest Hill Ave in 1973. In 1976, VA 150 was freewayed from US 1 to SR 637 Hopkins Rd. In 1979, VA 150 was freewayed from US 360 to VA 10. In 1983 or 1984, VA 150 was freewayed from VA 10 to SR 637. In 1990, VA 150 was 4-laned from Forest Hill Av to VA 147 and freewayed from VA 147 to Parham/River Rd. Posted: Fully posted; Error US 150 on a LGS existed on US 1-301 just north of VA 145 (referring to truck route for the Naval Supply Center) until about 2009. Legislative names: Edward E Willey Memorial Bridge over James River (9-21-89). Although VA 150 is a freeway, there are some substandard in-out ramps between VA 10 and US 1 requiring 15 mph movements. Is there a reason VA 150 can't be signed to VA 6? VA 150 #1: Appeared July 1933 as a renumbering of VA 312. It ran from US 29 near Amherst north to Kingswood. It did NOT touch US 29 (now VA 56) in Colleen. VA 150's northern endpoint is on today's US 29 in between its two SR 655 junctions. In Oct 1947 (CTB), VA 150 was eliminated. The northernmost couple miles became part of a relocated US 29 while the rest became SR 739. It is possible VA 150 was moved onto the modern US 29 from Amherst to Colleen at today's VA 56 briefly before US 29 was put on it. The project was referenced as VA 150 before completion. VA 150 #2: Created Feb 1961 (CTB) as new routing in Portsmouth, running from US 58 High St north on 7th Ave through the second Norfolk-Portsmouth Tunnel (Midtown Tunnel), then southeast along proposed Waterfront Dr. VA 337, Brambleton (proposed 337 ALT), then north on Bank St, then east on Virginia Beach Blvd to end at VA 168 Tidewater Dr. In June 1962 (CTB) this was replaced by US 58. This was so short lived it may not have ever been posted. Does not show up on the '62 Official. Anyone have a 1962 Norfolk County map? Creation: Appeared in July 1933 as a renumbering of VA 313. It ran from US 60 Sardis to VA 6 Lodebar. This is the only VA 151. 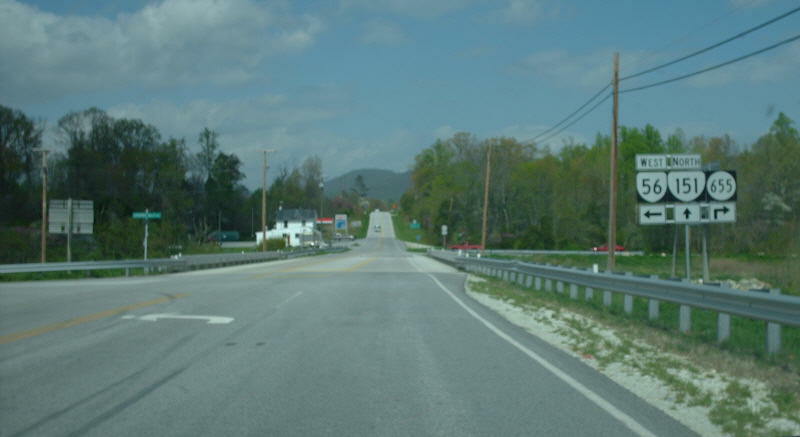 Adjustments: About 1938, VA 151 was extended north to US 250 (now SR 750) Afton, replacing some of VA 6. In Feb 1939 (CTB), VA 151 was rebuilt in the Wintergreen-Nellysford area, leaving behind SR 627 and pieces of SR 612 and SR 613. 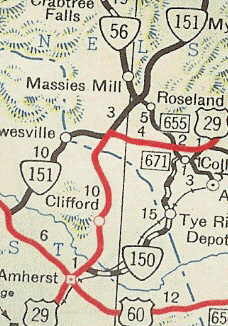 In May 1939 (CTB), VA 151 was straightened out between SR 610 and Lowesville in Amherst County, leaving behind SR 665 and SR 694. In Jan 1941 (CTB), VA 151 was extended over what had been US 250 to US 250 higher up the mountain. In Oct 1947 (CTB), VA 151 was rerouted at Piney River to head south towards Amherst, replacing a rerouted US 29. The old route from Piney River west to Sardis became VA 158 (now SR 778). See map scans under VA 150 #1 entry. In 1962 (bridge date), VA 151 was removed from SR 638 in the Avon area. In Sept 1989 (CTB), VA 151 was rerouted to its current end at US 250 in a swap with VA 6 (which had been re-extended to US 250 in 1963). Posted: Fully posted; from US 250 EB it is still posted as OLD VA 6. VA 151 is not recommended as a through route from US 250 to US 29. You are directed to follow VA 6 east to US 29 to avoid a short mountainous stretch. Creation: Appeared in Oct 1970 (CTB) as a renumbering of VA 158 through the SE leg of a triangle junction with VA 56 at Shady Lane This is the 2nd VA 151Y. Comment: VA 151Y was once the route of US 29 through here. VA 151Y #1: Appeared between 1936-43, connecting VA 151 to US 29 (now VA 151Y) as the NE piece of a triangle intersection at Shady Lane. In Oct 1970 (CTB), VA 151Y was renumbered as VA 56. I would've thought after US 29 was removed this would've been VA 158Y but I can find no evidence it ever was. Creation: Appeared in May 1946 (CTB) as a newly constructed route. It initially ran only from US 60 to US 17/VA 168. This is the 3rd VA 152. Adjustments: In Aug 1981 (CTB), VA 152 was extended as new primary routing to US 258/VA 134. Improvements: Paved and multilaned in 1950. 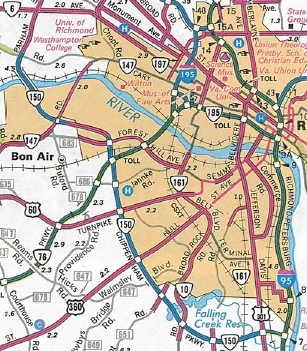 The 1981 extension was multilaned already (mostly 4-lane undivided) even though the 2008 Official still shows only the area around I-64 as multilaned. Posted: Fully Posted except it is not posted along Mercury Blvd in either direction. Comment: VA 152 is blown off by I-64 but there is a direct ramp from VA 134 SB at I-64 to VA 152 WB, marked only as Todds Lane. VA 152 #1: Appeared in July 1933 as a renumbering of VA 322. It ran from US 501 to the South Boston Airport via Edmunds St, Berry Hill Rd and Lomax Ave. In Sept 1942 (CTB), VA 152 outside the City of South Boston was downgraded to SR 852. Some of this road no longer exists towards the south end. In Nov 1942 (CTB), VA 152 was decommissioned within the City of South Boston. VA 152 #2: Appeared about 1943 as a renumbering of a piece of VA 258 running from VA 258./VA 10 Smithfield to Rescue at what is now SR 1006-1005 jct. VA 152 was downgraded to SR 704 in April 1944 (CTB). Creation: Created July 1933 as a 2-piece route: 1. US 460 north to the Amelia line (replacing VA 405; 2. US 360 near Swift Creek Reservoir through Winterpock to SR 602 (replacing the northern piece of VA 409 and possibly the mysterious VA 441). This has been the only VA 153. 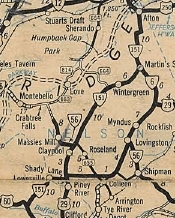 Adjustments: In Oct 1935 (CTB), the southern piece of VA 153 was extended north to VA 38 (now SR 708) near Wilsons Corner. In May 1938 (CTB), the northern piece of VA 153 was extended west along SR 602 to Amelia SR 612. In April 1951 (CTB), VA 153 was extended north to Scotts Fork, then west to amelia, replacing VA 38. 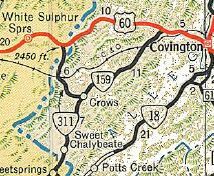 In Aug 1951 (CTB), VA 153 was rerouted at Scotts Fork to instead replace VA 148 north to US 360 as it runs now. Scotts Fork to Amelia went back to being VA 38. In March 1964 (CTB), the south end of VA 153 was moved eastward about 0.1 miles as part of a relocation of US 460. In June 1979 (CTB), VA 153's south end was moved eastward again another 0.25 mile to its current location as new construction below SR 660. The remaining portion of VA 153 was paved in 1935. Comments: VA 153 is an excellent connector from US 360 to US 460 heading for the Blackstone area. VA 153 was once the main road designated by Fort Pickett to reach their post from Richmond and was why VA 148 (now VA 153 north of VA 38) was put into the primary system. The 1939 VDOT report on primary system development had recommended that VA 153 be decommissioned from US 460 to SR 708 (then VA 38). Creation: Designated April 1962 (CTB) to run from the proposed I-64 location "up S. Durant Ave to the north side of Jackson River; thence northwesterly and generally parallel to the Jackson River and the C & O Railroad Belt Line to a connection with Riverside Street at its intersection with North Lexington Ave; thence northeasterly along Riverside Street to North Alleghany Avenue (US 220)"
This is the 3rd VA 154. 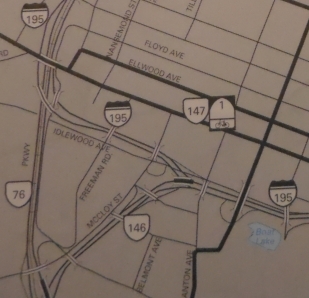 Adjustments: The VA 154 designation was contingent upon I-64's completion through Covington which was about 1966. 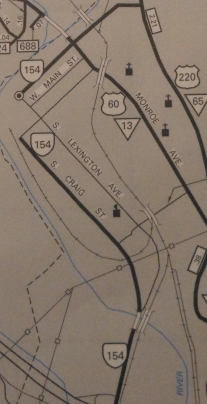 In Feb 1968 (CTB), VA 154 was moved from Durant St to Craig St via new alignment. It is unclear if the current routing of VA 154 in central Covington has always been the same. VA 154 leaves Riverside and juts east to US 220 on E. Hickory St. There is a break in the route "between Lexington St and Locust St" according to the 2003 Route Log (the City VDOT atlas from the mid 90s and the current DOT on-line map both show this as well). This would require new construction or several turns to connect Craig at Locust to Riverside and Lexington intersections. Improvements: Paved upon inception; multilaned south of Chestnut St and on Riverside Ave between US 60 and Hickory St. Comment: VA 154 was created to give "a major thoroughfare" from I-64 to US 60 and US 220 in Covington, so says the 4-62 CTB. Hmmmm I guess that didn't turn out so well. The first official map to label VA 154 was the 1986 issue. VA 154 #1: Appeared in July 1933 as a renumbering of VA 445, running from VA 10 near Garysburg southwest 5.1 miles. In Aug 1936 (CTB), VA 154 was extended west over SR 625 to US 460 Disputanta. 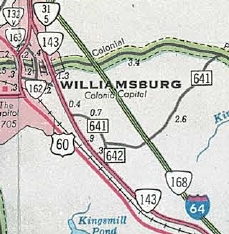 VA 154 was downgraded to SR 625 by Act of General Assembly in 1941 (alluded to in the Jan 1941 CTB). VA 154 #2: Appeared by Act of General Assembly in 1941 as a mileage swap with VA 154 #1, running from VA 36 (now Arlington at 15th Ave) Hopewell south towards Disputanta. In Sept 1942 (CTB), VA 154 was extended to US 460 New Bohemia. In May 1946 (CTB), VA 154 was extended south replacing parts of SRs 638, 630 and 621 to end at US 301 north of Templeton. In March 1948 (CTB), VA 154 north was truncated/moved to a rerouted VA 36. VA 154 was removed from Arlington Ave and placed on High St to end at current VA 36. In March 1958, VA 154 was renumbered as VA 156. Today, it is Millpond Rd leaving US 301 as VA 156 has been rerouted. Creation: Appeared July 1933 running from VA 5 Charles City CH to Carps Corner (replacing VA 413), then duplexed west along VA 4 to Talleysville, then replaced VA 440 north to St Peters Church. This is the only VA 155. Adjustments: In March 1934 (CTB), VA 155 was rebuilt north of Providence Forge, leaving behind SR 617 through Crisscross and an abandoned segment running souththeast along Rowley Marsh. In May 1943 (CTB), VA 155 north was truncated to VA 33 New Kent CH, leaving behind its VA 33 duplex (now VA 249) and SRs 606-642. In April 1949 (CTB), VA 155 north was truncated to US 60 Providence Forge, leaving behind SR 608. Around 1975, VA 155 north was re-extended to VA 249 Carps Corner. Improvements: Fully paved upon designation except between US 60 and then-VA 4 #2 (later VA 33, now VA 249). The rest of VA 155 was paved in 1935. Comment: VA 155 connects two county seats of sleepy counties. VA 155 is erroneously shown as VA 55 on the 1976 Official only. Creation: Appeared in July 1933 as a renumbering of VA 414, running from US 360 Mechanicsville around to VA 5, then west over the Battlefield Park Rd to end at Osbourne Turnpike. This is the only VA 156. Adjustments: In Aug 1936 (CTB), VA 156 was truncated to VA 5 near the Charles City-Henrico Line, leaving behind VA 5 and the US Gov't took over the Battlefield Park Rd over to Osbourne Tpk. In May 1952 (CTB), VA 156 was proposed by Hanover County to extended northwest to US 301/VA 2 in the Atlee area. The CTB rejected this request. In 1960 or 1961, VA 156 was rerouted to its current end at US 301/VA 35, leaving behind Millpond Ln. This was because VDOT did not want to build a separate interchange on I-95 for VA 156. In April 1961 (CTB), VA 156 was rerouted in Hopewell to use the current VA 156 Business route. 15th Ave remained part of VA 36. In 1967, VA 156 was moved onto the Harrison Bridge over the James River. The Charles City County approach to the ferry became SR 658. In Feb 1977, the Harrison Bridge was struck and severely damaged by a tanker ship. A passenger ferry was up in short order at the previous ferry launches and also in May 1977 (CTB), a small-scale ferry for cars and small trucks was also re-established. About Oct 1978, VA 156 was put back onto the repaired Harrison Bridge. About 1979 (CTB), VA 156 was removed from Old Williamsburg Rd on both sides of the new I-295. 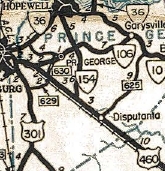 In Oct 1980 (CTB), Prince George County requested the VA 156 Bypass of Hopewell be created as an upgrade to SR 644. The CTB denied this request, but in Sept 1982 they assigned it. In Aug 1986 (CTB), VA 156 was removed from Hanover Rd and its VA 33 duplex near Sandston and instead routed over Airport Rd to US 60. VA 156 was widened from US 360 Bus to Stonewall Pkwy in 1968. 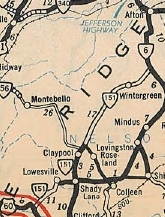 VA 156 was multilaned within Hopewell and on its VA 10 duplex in 1975. VA 156 was multilaned on its US 60 duplex about 1980. VA 156 was multilaned on Airport Dr in 1986. VA 156 connects several Richmond area Civil War Sites north of the James River. VA 156 north of the James River is not a particularly efficient way to get from Hopewell to Mechanicsville. The 1939 VDOT report on primary system development had recommended that VA 156 be decommissioned south of US 60. Creation: Appeared Sept 1982 (CTB) when VA 156 was given its eastern bypass of Hopewell. Posted: Fully posted; A white border unisign exists on VA 36 WB approaching VA 156 Bus. Comment: The 2003 route log and the 2008 traffic log both call the bypass 156 BYPASS and the route through Hopewell as mainline 156. However, there are some 156 Business postings in the field. Creation: Appeared in July 1933 as a renumbering of VA 443. Initially ran from VA 6 northeast to about 1.5 miles past VA 5 (now US 250). This is the only VA 157. Adjustments: In Aug 1936 (CTB), VA 157 was extended to VA 4 (now US 33). Improvements: VA 157 was first paved in 1935, north of Broad St. The extension to current US 33 was paved upon creation. The rest of VA 157 was paved in 1938. VA 157 was multilaned on the western half of its Quiocassin Rd route in 1977. VA 157 was multilaned on its US 250 duplex in 1983 or 1984. In 1993 or 1994, VA 157 was multilaned from VA 6 to Quiocassin Rd. An error US 157 assembly existed for several years at Quiocassin Rd but is now corrected. Comment: VA 157 is blown off by I-64. Gaskins Rd has made VA 157 irrelevant as a through route, as VA 157 makes turns onto 2-lane roads while Gaskins is multilane and has access to I-64. The 1939 VDOT report on primary system development had recommended that VA 157 be decommissioned in its entirety. Creation: Appeared in Aug 1999 (CTB) as a renumbering of US 58 ALT. This is the 4th VA 158. Improvements: paved upon inception; no multilane segments. Comment: Some DeLorme maps show this erroneously as US 58 ALT Business. VA 158 cannot be directly accessed from US 58 ALT EB west of Coeburn. Instead you must exit at SR 813 over to the VA 72-158 jct. Technically SR 813 is shown in the traffic logs as VA 158-P. Although technically VA 72 still exists through Coeburn, signs on VA 158 WB want you to use VA 72 south to 58 ALT west to SR 813 in order to reach VA 72 north. VA 158 #1: Appeared in July 1933 as a renumbering of VA 507, running from US 58 near Franklin through Isle of Wight CH and Smithfield and ending in the village of Rescue. This was a state route extension of US 158. VA 158 #2: Appeared in Oct 1940 (CTB) as a renumbering of VA 258. Ran from VA 12 (current US 340) near Newport northwest to VA 12 (current US 340 Bus) Alma. In May 1943 (CTB), VA 158 was downgraded to SR 650. 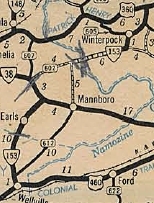 VA 158 #3: Appeared in Oct 1947 (CTB) due to a realignment of VA 151. Ran from US 60 near Sardis, north and east to VA 151 at Shady Lane, then east along old US 29 to present-day US 29 at Colleen. See map scans under VA 150 #1 entry. 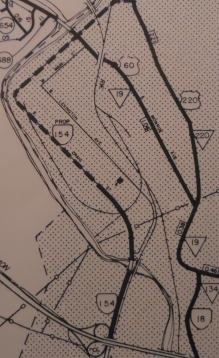 In Oct 1954 (CTB), the segment west of VA 151 Shady Lane was downgraded to SR 778. In Oct 1970 (CTB), the remaining Shady Lane-to-Colleen segment was renumbered as part of VA 56. Creation: Appeared in Oct 1947 (CTB) as a renumbering of US 60, running from VA 311 Crows to US 60 (now SR 600) Callaghan. This is the 2nd VA 159. Adjustments: About 1971, VA 159 was extended north to the I-64 interchange, replacing a little of US 60 plus new construction. Posting: fully posted; VA 159 NB is posted past the I-64 overpass to the loop ramp to I-64/US 60 WB. Scenic Byway: entire route, since 5-17-90. Comment: VA 159 is a pretty easy drive, providing access to VA 311 from the Covington area. VA 159 #1: Appeared in July 1933 as a renumbering of VA 427, running from VA 6 Crozier to VA 5 (now US 250) near Oilville. In May 1945 (CTB), VA 159 was downgraded to SR 670. Creation: Appeared Oct 1940 (CTB) as a renumbering of VA 67 running from US 23 Appalachia to the KY line. This is the 2nd VA 160. Scenic Byway: Entire route since 3-8-93. Comment: I finally got to drive VA 160 in 2008. It is extremely twisty on its western half ascending Black Mtn, which is the highest point in Kentucky. Heading eastward, there are expansive views, although some of it is of mining interests. VA 160 was briefly US 23 in the early 30s. VA 160 #1: Appeared in July 1933 as a renumbering of VA 431, running from VA 5 (now US 250) Short Pump to Rockville. See scan under VA 157 entry. In Oct 1940 (CTB), VA 160 was renumbered as VA 271.